Are you looking forward to your senior years? For some, retirement holds the promise of free time and disposable income. For others, it marks the start of a slow decline into ill health. There’s no rule that says growing old has to mean growing sick. Just look at the centenarians who still run races and participate in their favorite hobbies. If you take charge of your health, you too can keep deadly lifestyle diseases at bay and live a longer, healthier life. So what, exactly, does staying healthy after 60 look like? Preventive care is more important when you’re older, so the best place to start is examining your health care coverage. If you only have Medicare Parts A, B, and D, you’re missing out on preventive care benefits that keep you healthier for longer. Dental and vision care aren’t generally thought of as medical needs, but neglecting them can lead to very real medical problems. If you can’t see well, you’re at risk of falling and breaking bones. And if your gums get infected due to a lack of dental care, it could lead to heart disease, stroke, and certain cancers. You’re more likely to visit the dentist and eye doctor if your health insurance covers it, so buy standalone insurance or upgrade your Medicare coverage to a Medicare Advantage plan that includes these benefits. Unlike Original Medicare, Medicare Advantage plans are sold through private insurers like Aetna. Don’t worry — these plans still cover all the same benefits as your existing Medicare coverage. The older you get, the less active you become. For most of us, physical activity drops off in our 30s when we get busy with kids and careers. Instead of becoming more active during retirement, we grow more sedentary. In fact, according to JustStand.org, the average American spends 12 hours a day sitting, which doesn’t include sleeping. 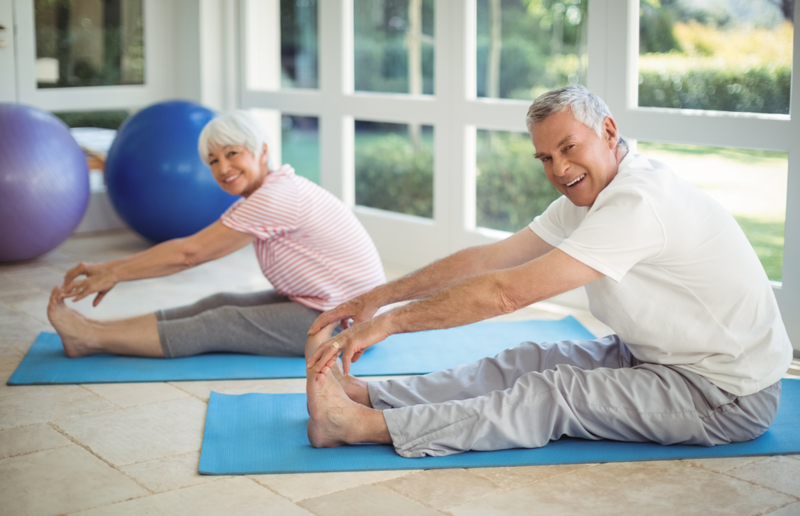 Unfortunately, older adults aren’t making up for it with exercise either: according to the Department of Health and Human Services, only about one in three seniors are physically active. There’s a reason they call sedentarism the “sitting disease.” Spending too much time sitting increases your risk of heart disease, cancer, diabetes, osteoporosis, and early death. To avoid these ailments, get at least 150 minutes of heart-pumping exercise per week and avoid long stretches of sitting. Setting up a home gym is a great way to accomplish this. With a home gym, you can break up sedentary activities with short workouts to avoid the negative effects of sitting too long and meet your fitness goals. Fitness is only one piece of the puzzle. Your body also needs high-quality nutrition to run at peak performance and fight off disease. There are added challenges to eating well when you’re older: you need fewer calories per day, but you also need those calories to be highly nutritious because your body is less efficient at absorbing nutrients. On the bright side, seniors have more time to prepare balanced meals now that they’re retired. Adapt your kitchen with tools to make cooking more comfortable (ergonomic cooking utensils and anti-fatigue mats are a great start) and build your diet around fresh fruits and vegetables, legumes, nuts, and whole grains. If you eat animal products, round it out with moderate portions of fish, poultry, and other lean meats. Variety is key! If you need help stocking a healthy pantry, take a look at this resource for guidance. There’s no shortcut to good health. Staying healthy into your senior years requires constant attention to your diet, exercise, and preventive care. However, when you put in the effort and make your health a priority, it always pays off.